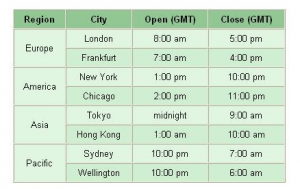 Forex times, when is the best time to trade forex worldwide? You can trade forex 24 hours a day, five days a week. The foreign exchange markets are worldwide. And therefore follow a 24-hour global timetable. The trading week for forex begins on Monday morning in Sydney, Australia and follows the sun westward. As the world’s major capital markets open and close from Tokyo to London and finally closing on Friday evening in New York. The forex market offers traders the unique advantage of trading opportunities. In both rising and falling markets. And unlike other markets, there are no restrictions or additional costs for short selling. With daily turnover reaching $5.3 trillion*, forex is the most liquid market in the world. This liquidity often results in more actionable prices. Whenever they occur – 24 hours a day, 5 days a week. Want to practice how to trade? Open a demo account!